Tropical montane cloud forest exhibits great heterogeneity in speciescomposition and structure over short geographic distances. 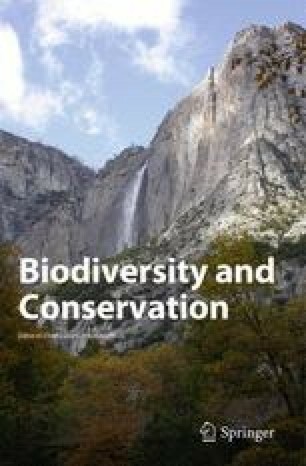 In central Veracruz,Mexico, the conservation priority of seven cloud forest fragments was assessedby considering differences in woody plant species richness and complementarityof species among sites, forest structure, tree mortality, and timber andfirewood extraction as indicators of anthropogenic disturbance. Densities oftrees ≥5 cm dbh (360–1700 trees/ha) weredifferent among the sites, but basal area (35.3–89.3m2/ha) did not differ among fragments. The number of dead trees rangedfrom 10–30 to 170–200 trees/ha. The fragments'species composition was different but complementary. The Morisita–Hornindex indicated low similarity between fragments. A non-parametric estimator ofspecies richness indicated that more sampling effort would be necessary tocomplete the inventory (15 additional trees and two understory shrub species).Unfortunately, most of the fragments are threatened with deforestation. The numberof cut trees was similar among sites (0–15 cut trees/0.1 ha).Sites with immediate need for conservation were close to settlements, with highnumbers of cut trees and no legal protection. The selected sites represent thevariety of situations that exist in the region. Given the high complementarityobserved between fragments, a regional conservation approach will be required topreserve the last repositories of part of the tremendous biodiversity of theonce continuous forest in this region.